The need to exercise my creativity and the work horse in me always seems to want to create something from scratch. So, when I proposed to Graeme months ago that I wanted to make our son a bed instead of buying a new one, he was not at all surprised. I was keen on getting some extended life from the crib mattress and figured it was a perfect way to transition Theo from crib to bed without too much change. What appears to be a short project ended up taking us 4 months. I am not kidding you. Why so long you may ask? Well, we actually finished building the frame and covered the whole thing in batting back in March. It sat in the basement untouched for a while because we either a) were trying to forget all about it b) never had enough condensed time to tackle it. When you have a 2 1/2 year old that is curious about EVERYTHING, you leave projects like these for his nap time (which is our cue to flop on the couch to rest from dealing with our little tornado). A few weeks ago, Graeme brought the bed frame upstairs and put it in the dining room, there becoming a daily reminder of a project unfinished. This past Saturday, while Theo was napping in his stroller, home from a walk, we shut the kitchen door and staple gunned the fabric to the frame. The corners were tricky and piecing fabric together (as it was three separate pieces) was finicky, but after all the sweat (well, not that much), we were done! 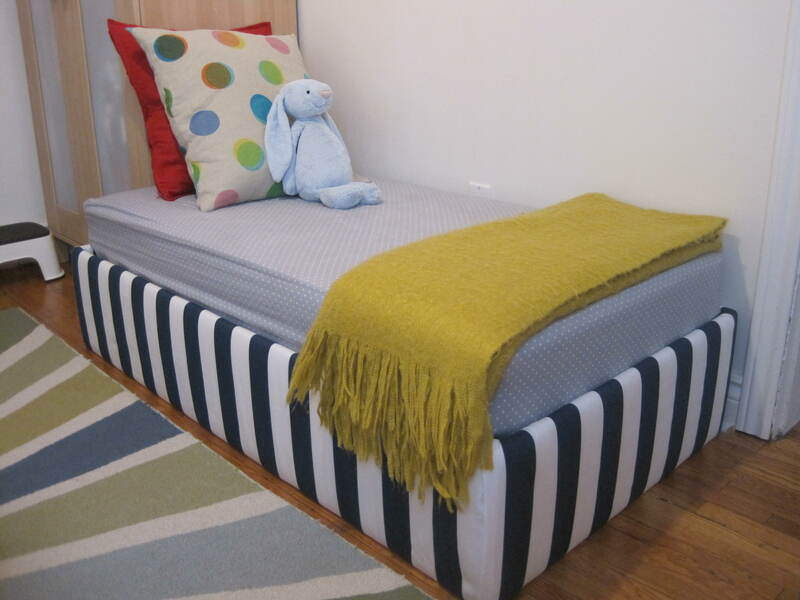 We used the instructions from design mom, but altered the measurements to fit our crib mattress. We tripled the cotton batting for extra cush and completed the project for about $70. It should only take about 2 – 3 hours to complete (or nearly four months on our time line). It was worth the wait. The first thing Theo did when he saw it after his bath was, “My new bed!” where he then proceeded to climb aboard, sans vêtement, and jumped up and down yelling, “I’m going to sleep in my new bed with no diaper and no pyjamas!”. Needless to say, it was well received. Your timeline makes me feel less lazy — thank you for that. Aw, thanks. The ability to complete projects is directly linked to (a) the number of children you have (b) how much time said child/children sleep. I love this! I’ve been wanting to do this but Im going crazy adjusting the measurements, do you remember what you used for standard crib mattress ? Hi There! Unfortunately I don’t have the measurements on file any more. I was working off of a scrape piece of paper that I hummed and hawed over at Home Depot, hoping I was making the right choices when they cut up all the wood! Best of luck to you! It wasn’t easy!